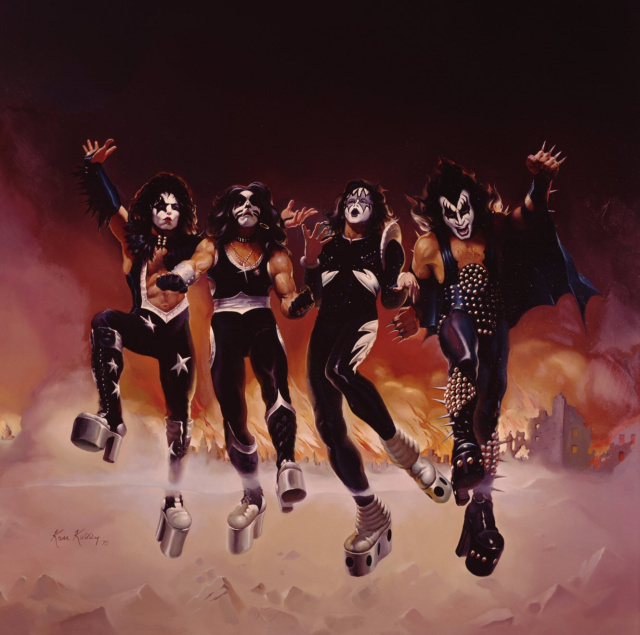 Hot on the heels of their breakthrough hit album Alive!, KISS released their fourth studio album Destroyer which is considered the most ambitious studio recording of KISS’s ’70s catalog. Bob Ezrin, who had previously worked with Alice Cooper, was brought in to produce the album and among the production flourishes Ezrin introduced to KISS were sound effects, strings, a children’s choir, reversed drumming and the eerie, echoing sounds of screaming children over Gene Simmons’ vocals on “God of Thunder.” Upon its release, Destroyer reached the No. 11 position on the Billboard Top 200 and, with the help of the surprise top-10 hit “Beth,” was their first album to go platinum. To this day, Destroyer remains one of the group’s most ambitious recordings and greatest accomplishments. In both Kerrang! and Guitar World magazine it is listed as one of the ”100 Greatest Heavy Metal Albums of All Time” and in 2003, it was included on Rolling Stone magazine’s list of the 500 Greatest Albums of All Time. Now, with today’s state-of-the-art technology, this landmark release can be heard the way that KISS intended.